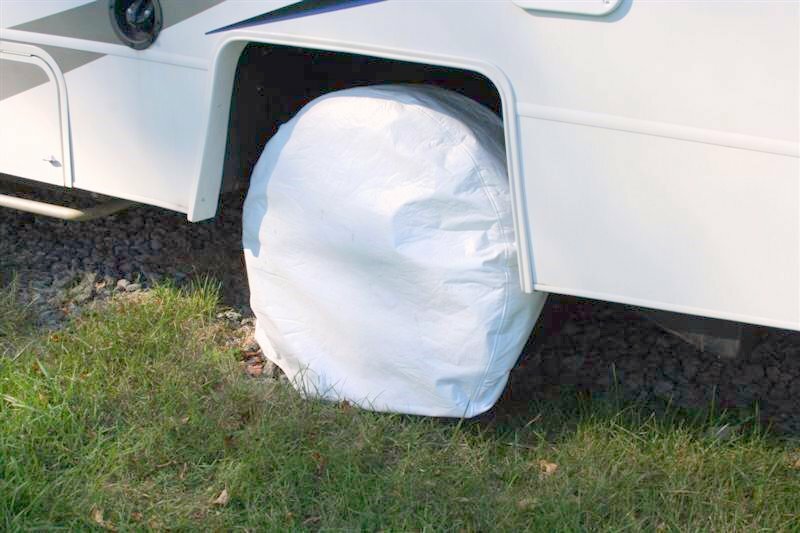 RV Tire Safety: Tire Covers - Do they do any good? Hi, Roger. You certainly do a service with this blog! Seems I heard in a tire safety class that if you are going to be parked on concrete for very long (a week or more?? ), you should put a barrier of some sort between your tire and the concrete. I don't remember the reasoning... seemed like the concrete interacted in a bad way with the rubber? Any truth to this, or am I "mis-remembering"? Thanks. Thanks for the timely post. I'm looking at some tire covers for our rig, and just wasn't sure if I wanted the white ones or not. Now all I have to do is find the white ones that are the easiest to put on and take off. That was always the hardest part with the others that we had on our old MH. Lets see if i can answer all three questions. I always have my tires covered when parked at home. If i am at a campground for two days or more I cover my tires unless it is heavy overcast and / or raining ( No Sun). Parking con concrete is probably OK unless it is seeping groundwater. You should not park on wet dirt or sand as moisture can leach through the rubber over weeks. Also don't park for weeks at a time on asphalt as the oil & tar can attack the rubber. If you order please tell them where you found the information to go to their site. Thanks, Roger. I'll check that site. Appreciate the information. So the answer to the question is a definitive maybe, it is up to your own good judgement? Very good article. I'm lucky, in that our RV is parked on the North side of the house, and in the shade, so I don't need the covers for the Sun/temperature, BUT, I wondered if they make any kind of difference for the Ozone? It would seem that it wouldn't matter, since we only cover the outside of the tire, and the Ozone will reach all of the tire, but I figured I'd ask the expert? When a tire is rolling down the road the temperature of the tire tread is typically arround 150 degrees for a passenger car at freeway speeds. In racing, the tire pressure, caster and camber are adjusted to make the tire run at about 190 degrees. Some race crews use higher temps. The temperature at which you start to worry is more like 300 degrees. I suspect that a temperature of 100 degrees has little effect on tire life. The tire cover is more for UV protection than temperature protection. To me the answer is pretty obvious. I think I would rather have a much less expensive cover get old & die from heat & UV exposure rather than my tires. Was my example of the aging rate at high temperature confusing? PapPappy. No good way to protect from Ozone with a cover. If you don't park with tires in the sun days at a time probably not worth the effort for you. Tires running down the highway normally run 30 to 60 degrees F hotter than ambient. Race tires have a life measured in minutes of use at racing speed or possibly months in controlled condition storage so their info doesn't translate to highway use for tires. 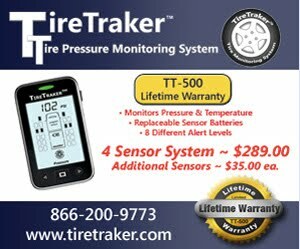 I also believe their max temperature is closer to 215 than anywhere near 300 and would expect that a tire exposed to 300 will fail in just a few minutes. I do know that some tire materials can loose over 50% of their strength at much above 250 F.
Tire "aging" and loss of properties (strength & elasticity) is cumulative and cannot be reversed. I will stand behind the chemistry and my belief that minimizing acellerated aging, exposure to high temperature, Ozone & UV effects are good polices when possible. Just to let everyone know. I am trying to collect samples of different materials to do additional testing of dark colors as well as to measure UV blocking. Thanks for the great info Tireman9. What do you know about a product called 303 Protectant. It is suppose to be a water based product, as opposed to a silacon based one, and is touted as having the ability to "replenish" the effects of sun/ozone to help extend the life of tires? Any truth to these claims? I your humble opinion. Sorry for slow reply but I had the "Notify" shut off. I would think if 303 really worked the magic as claimed tire companies would use it on the ultra expensive tires. Not saying it is of no value just questioning the level of protection claimed. I am trying to develop a test but no luck so far. If you have dual tires in the back, do both tires need to be covered or just the one that is exposed to the outside. Good question Tim. I was guessing only the outer but I could be wrong. As for the 303 I have noticed over the years ALL additives and protectants claim to be miracle ingredients. Most were eventually proven useless.